Since selling her landmark Beverly Hills enterprise, The Farm of Beverly Hills®, just a few years ago, following two decades of successfully leading it to become one of the West Coast’s most popular dining establishments, Fran Berger has rapidly ascended the national media spotlight, establishing a premier presence as one of the country’s leading experts on Home Entertaining. As the founder of Home Entertaining & Sophisticated Living with Fran Berger, the entertaining dynamo is being honored for her contributions in her sphere of influence by one of the largest business publications of record in the United States, the Los Angeles Business Journal, for the impact she has made in such a short period of time helping others to entertain with ease. Last week, Berger was selected by her professional peers, comprised of industry heavyweights and change makers within the Greater Los Angeles region, earning an award at the Los Angeles Business Journal’s 2018 Women’s Council & Awards. The ceremony, which celebrates the incomparable achievements of female business leaders, was held on Friday at the JW Marriott in Los Angeles’ L.A. Live in Downtown Los Angeles, and was presented by Diamond Sponsor UBS, Platinum Sponsors American Airlines, UCLA and Wells Fargo, and others. 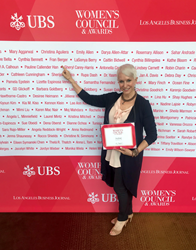 Berger was handpicked to earn a spot as one of the city’s top business leaders at the Los Angeles Business Journal’s Women’s Awards, attending the ceremony and graciously accepting her award as a 2018 Finalist. With the launch of her national lifestyle brand’s latest division, Design & Consulting, Berger has also expanded her service offerings as a home entertaining consultant. It is in this role that she works closely with select clients to help them curate picture-perfect experiences for their guests. Whether a new or established homeowner, or an interior designer, Berger personally shops for her clients, taking note of their interests and stylistic preferences, to assist them with stocking their beautiful dining, kitchen and lifestyle areas with gorgeous glassware, kitchenware, barware and other entertaining accouterments that reflect their sensibilities and entertaining style. For more information on Fran Berger, visit http://www.franberger.com.